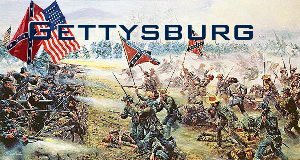 There is a group planning to have a Rally and burn Confederate Flags on this Day at Gettysburg National Battlefield! They say to make Trump Supporters Upset. Well we know this group, ANTIFA, also burns Old Glory! You don’t have to be a Trump Supporter to be an American Patriot! Well enough is enough. Show up, Stand Up, in your support for AMERICA! Yes she’s not perfect but she’s is our Chosen Country! If you hate US, Leave! This is not the Iron Curtain. REMEMBER CONFEDERATE SOLDIERS ARE AMERICAN VETERANS! And you don’t Disrespect a Veteran!!!!!!!!!!!!! The coming civil war. The left has been at war against America for decades. We must recognize that we are at war in America. While conservatives accepted Obama’s elections and even stuck to the legal process when Obama repeatedly violated the Constitution, the neofascists, nee liberals, are willing to use violence and illegal actions by the Deep State to negate the peoples votes. In 1968 England was warned. This is the full text of Enoch Powell’s so-called ‘Rivers of Blood’ speech, which was delivered to a Conservative Association meeting in Birmingham on April 20 1968.
growth of the immigrant-descended population. It is like watching a nation busily engaged in heaping up its own funeral pyre. Obviously Kelly has never read the Koran. No Immigration & Customs Enforcement NO ICE sign REMOVED! From Minneapolis (MN) to Hamtramck (MI) to Falls Church (VA) to Paterson (NJ) and many other towns and cities across the fifty states, the Islamic Movement is quietly conquering America. against America, and the hard-left Marxists – including nearly all of the local and national media – are collaborators in the enemy’s efforts. As UTT has previously reported, Minneapolis, Minnesota is currently enemy-held territory and will require force to take back. Sweden it is only a question of time be4 they will need military intervention from abroad in order to avoid a humanitarian catastrophe.